Name unknown. Location Sheffield Road. See note below. Photo courtesy of Wayne Parkes. 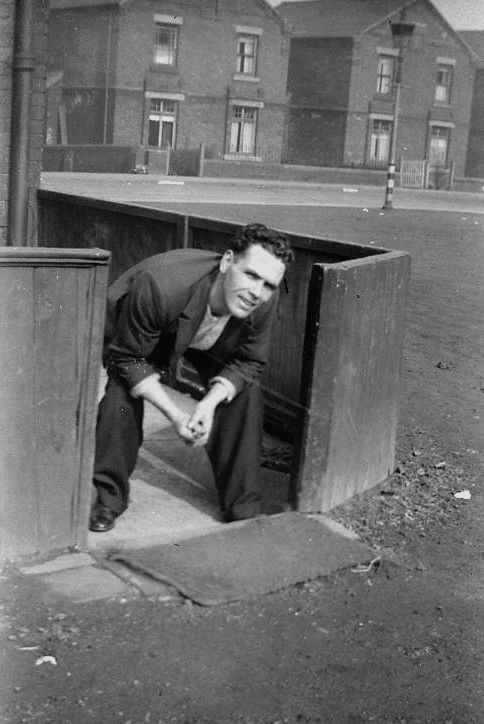 Have you seen the photo of Len Doxey further down the photo Gallery when he was an Air Raid Warden 1939-1941? The photo is of my Grandad Leonard Doxey, taken at his home 211 Sheffield Road. I’m pretty certain that the house is number 211 Sheffield Road, and the photo was taken pre-WW2, before the Bungalows or Pre-fabs were built. The house was the end one in “Hutchby’s Row” as we knew it. I was born at number 223 (next to the other end of the row) and all the time I was growing up there, Len and Ivy Doxey lived at 211. Harry and Aubrey were both members of the Savannah Dance band. The Pre-fab road was built by German Prisoner’s of War, between number 211 and the gas lamp shown just to the right of the photo and the Empire Cinema (where the Doctor’s surgery is now) was across the pre-fab road from “Doxey’s End” as we knew it. .
Len & Ivy Doxey had a daughter, Dora who married Dave Froggatt and a son, Terry, who was a bit older than me. Dave would probably be able to tell you more – he’s well into his 80’s and has lived in the district for many years. As an aside, when the Pre-fab road was built they made a vehicle entrance off the road into the backyards of our houses and when I was very young, I used to ride a 3 wheeler trike up and down the Pre-fab road. I remember that one day I was racing down the road at some speed, tried to turn into the yard, missed, and hit the angled piece of wooden fence shown on the photo and smashed both it and my trike. I went home with the front wheel in one hand and the back 2 wheels in the other and told my Mam and Dad that “I’ve brokken me bloody bike!”. Thank you ever so much for this information. All I have are a few photos of my granddad and the info you have given me has made my day. I really do appreciate your comments.